It started with a tweet. And a very long drive to Pennsylvania. Our friendship began on twitter, so why not go a step further and fire up the laminating machine? Whoa. I am getting way ahead of myself here, the thought of laminating tends to do that to me. So let’s go back to that long drive and talk about Mia. Mia and I met close two years ago and have become fast friends. Spoonie-sisters that share the unfortunate bond of migraine but also a love of dogs, shark-week and loose-leaf tea. Mia suffers from terrible migraines. So drastic and overwhelming that I feel like any words I might conjure up would not adequately describe their searing pain and awfulness. But she was able to find a clinic that specialized in the type of migraine she was having, however it would require a long road-trip. Ten hours in the car to be exact. And so we come to the aforementioned tweet. So, the only response, of course was to agree, that yes she was now a member of the club. I have traveled for medical care quite a few times. So I responded in kind. And then I thought, hey why not. 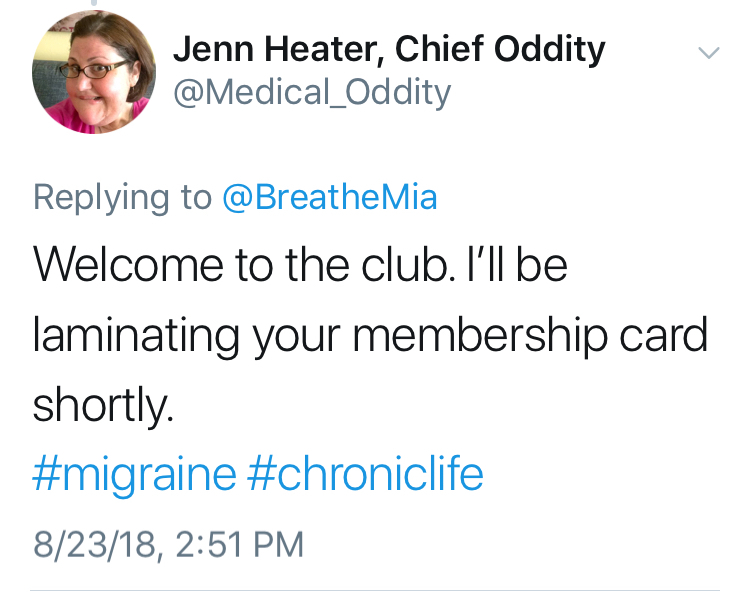 And so the Chronic Illness Club was born. As it says on the landing page: The rules are simple. You’re chronically ill. And it’s all in good fun. The circles on the back are for badges/stickers. Mia has earned her, travel far, far, away for treatment badge. 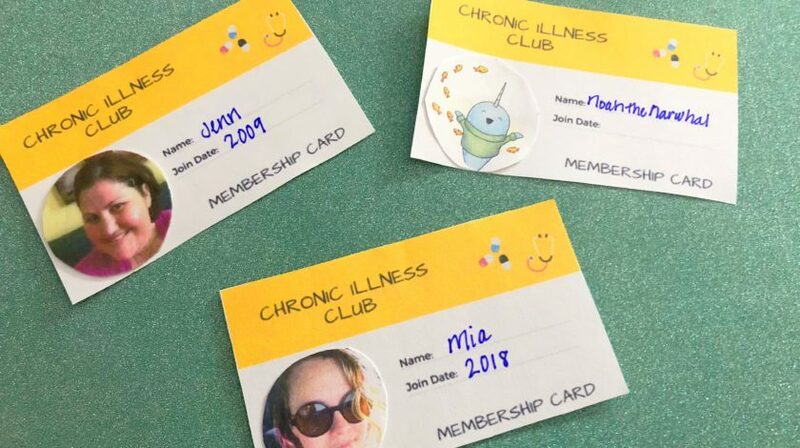 We’ve all earned our fair share of badges as we stumble through chronic illness looking for answers, looking for relief, searching for that light at the end of the tunnel. 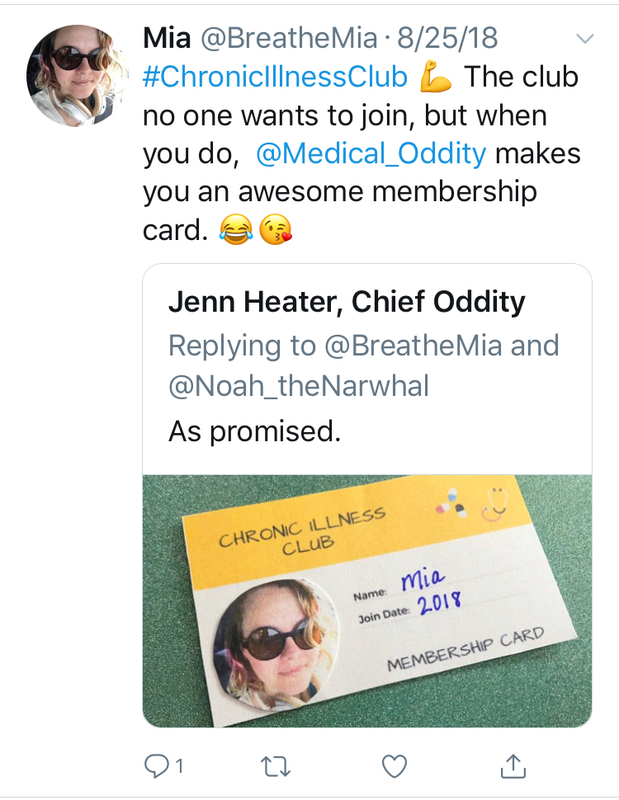 So I hope the Chronic Illness Club card makes you smile today. It made Mia smile. And with that it has fulfilled its purpose.